Giveaway is now CLOSED. BUT please keep on reading and find the scrumptious recipe at the end of this post. Sometimes the mere suggestion of a twist on tradition is enough to get me going in the kitchen. And I wasn’t even thinking about Chanukah yet. On the last day of the outdoor Westport Farmers’ Market in November, organic farmer, Patti Popp of Sport Hill Farm, beckoned me to come check out her pile of brussel sprouts still firmly attached to their stalks. My focus shifted as I noticed the generous, fan shaped LEAVES fanning out at the tip of these nobby supportive stalks. THE LEAVES? I had never given them a moment’s notice, and likely had never even seen them before. They were both dusty and vibrant and Patti encouraged me to experiment with these lovelies as wrappers for whatever filling I saw fit. So I turned to a traditional Eastern European Jewish recipe for stuffed cabbage and adapted it to my liking, which is to say just a hint of traditional sweet and sour with a more assertive Middle Eastern kick. These leaves were much easier to handle than cabbage. Their deep dusty green suggests that they are more nutritious and they don’t need to be pre-cooked the way cabbage does. Best of all, there is none of that weird, cabbage shtink permeating the kitchen. The reward was a more toothsome, deeper vegetal taste and a brighter, easier to handle wrap encasing this simple filling. I kept the filling for the stuffed leaves at a ratio of 2:1, meat to brown rice, so you can leave room in your (ahem) carb allocation for more latkes to enjoy with this rich tomatoey broth. M’s family is big on serving saucy dishes for Chanukah and I’ve come around to their thinking. Deeply flavorful sauces provide crispy latkes (potato pancakes) with glistening richness: the perfect match for your perfectly browned latkes. Adjust the proportion of sweet: sour: spicy in this sauce so it pleases you. Once it all bubbles for a bit and comes together, it will only get better as it sits in your fridge. Definately make enough for leftovers. Make your favorite latke recipe, and serve alongside these stuffed and rolled treasures. Notes: I use Grow and Behold’s 90 % lean ground beef. All of their beef, chicken, lamb is certified OU Kosher, pasture raised and free of hormones and antibiotics. Check their site to learn more about ordering and read what I had to say about them in a previous post. The Westport Farmers’ Market has moved indoors for the winter. Dates: Dec. 8-March 16 on Saturdays, 10-2 at Gilbertie’s, Westport, CT. Click here for more information and directions. And because everyone loves a party, I joined this super big one, with a long list of contributing bloggers. Together, we have created an array of recipes to help you celebrate. 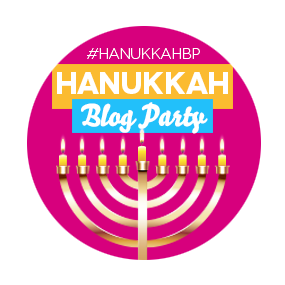 This first ever Chanukah Blog Party is hosted by Leah of Cook Kosher and Miriam of Overtime Cook. Check out these Chanukah themed recipes, treats and crafts from Jewish bloggers all over the world. How to enter: Leave a comment on this post and tell me what your favorite Chanukah treat or tradition is. 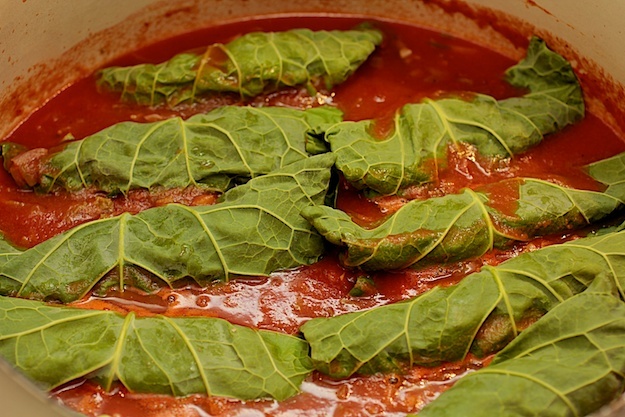 This is a fun and flavorful twist on classic Jewish stuffed cabbage. 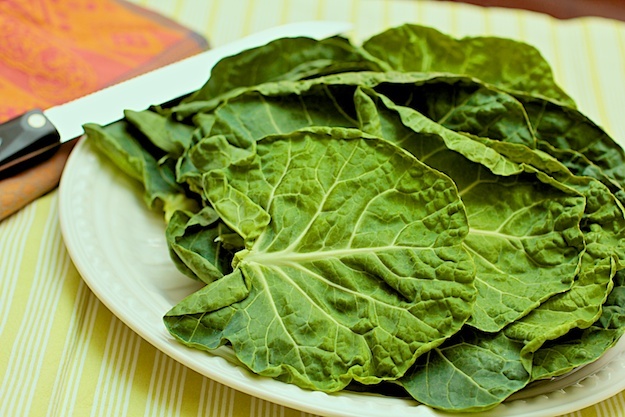 The brussel sprout leaves are easier to manage and do not need to be pre-cooked. Feel free to play with the seasoning, making it more Middle Eastern by adding additional Ras El Hanout or cumin. Combine 3 cans of tomato sauce, lemon juice, brown sugar, salt and pepper. Stir and simmer until combined. Would love to know what makes Papa Leo’s latkes special! Happy Happy Chanukah. Stuffed cabbage was one the first things I made when I started cooking. I am really loving this recipe of using brussel sprout leaves! You were an ambitious and brave new cook! I love the artistic aspect of the rolling and these brussel sprout leaves are much more pliable and forgiving than cabbage leaves. LMK how it turns out for you. Favorite Chanukah treat would have to be donuts! I love them also, especially when filled with dulce de leche. Eggnog filled? I have never had the pleasure! Brussel Sprout leaves sound like so much fun! We always had stuffed cabbage for sukkot but the weather is right and this would be a delicious, comforting dish for any night of winter. I LOVE any food that is stuffed so your recipe is perfect for me. I can’t wait to try it. Thanks. YES! And the leaves are super easy to handle. You’ll enjoy the change, I am sure! I love all stuffed things, also. What else do you stuff? My favorite chanukah treat has got to be donuts! This recipe looks fabulous and totally different! Wow, these look amazing. I have never seen brussel sprout leaves but your description sure makes me wish I had. I will have to try and seek them out. Maybe I will plant brussel sprouts just so I can have my own source! Shoshana, LMK if you need help converting the filling to vegetarian. It would be easy to chop up whatever is seasonal (squash, onions..) and mix with the brown rice. I don’t know how tough it is to grow brussels but if you try it, send pics!! Watch your farmers’ market and I think you will find them, though. If not, ask your farmer to keep the leaves on! Don’t you love approaching these traditional recipes with a little bit o’a twist?! 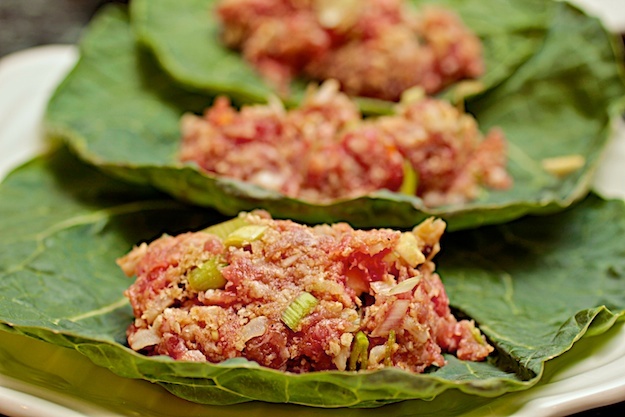 Try these wonderful leaves as your wrapper next time you want to roll up some delicious filling. Chopped bits of dried apricots or fresh in the summer? Sounds yummy either way! Impossible to resist, for sure! What a great take on a classic. Thanks! 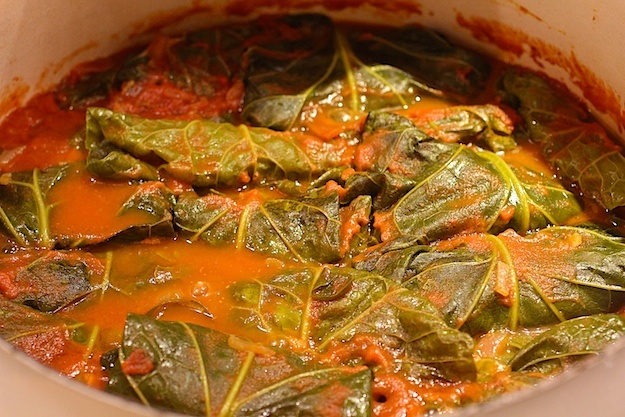 my husband loves stuffed cabbage–he would be so happy if I made this! I look forward to homemade latkes every year (even if I am the one making them). LMK how your guy likes this recipe. I am so happy to discover these easy to use leaves! Classic with a twist is my fave! For some reason,zatar is not my fave spice combo (I think it’s the texture) but feel free! I love the different sauce recipe. It sounds like it’s not too sweet. My favorite tradition is time with my family. I love getting to play with my kids, especially in front of a fire when it’s cold! Sounds like a perfectly lovely day or eve! Enjoy! favorite is fresh out of the pan latkes! love your blog its on my favorites now! Liz this looks like such a fun dish to make, chanukah sameach. my favorite “chanukah” food (cause I don’t eat to much during the year ) is DOUGHNUTS!!! I love donuts and sufganiyot. I wait all year for them. Waiting makes them all the sweeter, I agree! Glad you think so. Chanukah Sameah to you and yours! It was! I can’t wait to make it again. I’ll be on the look-out for the brussel leaves when I go to my farmers’ market. I am so lucky to have a year round market in my town! Favorite Chanukah food is donuts!! Happy Chanukah! I love the idea of making these foods more appealing. My favourite Hanukkah tradition has to be everyone prepping the meal together! Just a nice family feeling. Definitely donuts with chocolate frosting on it..! There are lots of sufganiyot fans out there! Fascinating to learn about other cultures’ traditions for Chanukah! LMK how you like the fritters. Wow. Brussels Sprout leaves. Who knew? Can’t wait to try this recipe. Thanks for the inspired tip and all of the great recipe links! It’s great fun to learn about a new ingredient, especially one that is so deeply green, ie: healthy and easy to use! ENJOY! I LOVED your New Year’s Eve re-cap. I was working on one also. Stay tuned for this week’s post!